The Leprechauns Made Me Do It is the message on this green Irish t-shirt. This exclusive design Irish t-shirt, from The Irish Gift House, features our Shamcus motif on the back below the collar! 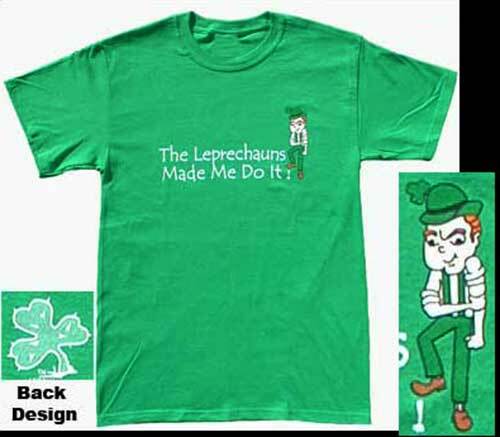 A full color leprechaun is featured on The Leprechauns Made Me Do It Irish t-shirt. This humorous, 100% pre shrunk cotton, Irish green color t-shirt is available in both youth and adult sizes.